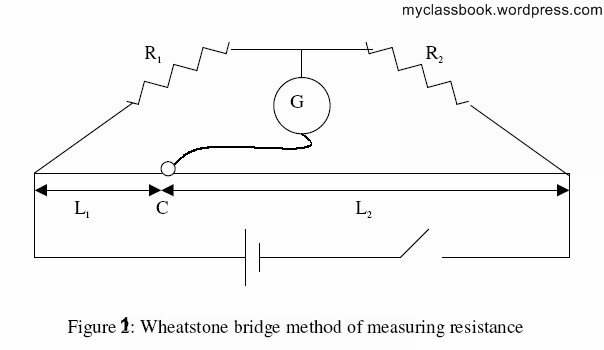 Another method of measuring the value of a resistor is the Wheatstone bridge. This device sets up a parallel resistor system that measures the differences in voltage between two legs of a circuit. If there is a difference of voltage between the branches it will be detected by the galvanometer. A special type of Wheatstone bridge is a slide wire bridge. The setup for a slide wire bridge is shown in Figure 1. In this case, there is a wire of constant resistivity with a contact that can move over the entire length. Where R1 is a specified resistance. Measure the resistance of an unknown resistor using an ohmmeter. shown in Figure 1. Turn on the power. Measure the current flowing through the resistor. Calculate the value of the unknown resistor using Ohm’s Law. Find the % difference between your two values. Set up a slidewire bridge circuit as shown in Figure. The wires connecting the resistances and the bridge should be as short as practically possible. Use a decade box with a known resistance as R1. This should be set to a value about equal to R2 (as measured by an ohmmeter). You can test this value by changing the decade box resistance and testing the bridge balance point until it is near the center of the bridge. Contact is made to the wire by sliding contact key C. Do not slide the key along with the wire while it is pressed down. This will scrape the wire causing it to be nonuniform. Have the instructor check your wiring before activating the circuit. Activate the circuit by closing the switch S, and balance the bridge by moving the slide wire contact. Open the switch and record R1, L1, and L2. Leave the switch open unless actually making measurements. Repeat procedure 1 for R1 settings of (a) R1 ? ?3 R2 and (b) R1 ? ?0.3 R2 . Compute the value of R2 for each case and find the average value. Compare this value to the directly measured value of R2 by finding the percent difference. Repeat the previous procedures with a large known resistance R1 and record your findings.